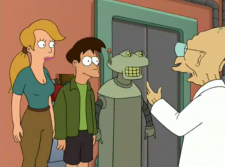 Fry, Bender and Leela's replacements are a woman, a man and a robot supposed to replace the Planet Express crew, Leela, Fry and Bender respectively. During the first Omicronian invasion of the Earth, for which Fry, Bender and Leela had been drafted by the Earth government to defend the planet, Professor Farnsworth assumed his crew was lost and was already looking for replacements. He was unfortunately interrupted when the real crew returned from the battle, he was forced to tell the interested parties to go, though advised them to come back soon, a week at the most. It can be assumed that Farnsworth still thinks ill of his current crew's chances, such as suggested in "The Sting". The man who replaces Fry bears a resemblance to Universe 1 Fry. The replacements for Fry and Leela appear among the Zombies infected with the Twitt-worm in the episode "Attack of the Killer App"
Farnsworth: You'll be the captain, you'll be the delivery boy, and you'll be the alcoholic, foul-mouthed-- [The real crew walks in.] Oh God, you're alive. I mean, thank God you're alive. [To the replacements.] Sorry, check back in three days, a week at the most. This page was last edited on 20 December 2014, at 17:59.